The newly proposed change (29 CFR 531) would effectively return the rule to its pre-2011 status and remove the restrictions on how tips can be distributed. In layman’s terms, under the new ruling, if an employer is paying the full Federal Minimum Wage of $7.25 (not taking the Tip Credit), then the employer could split the pooled tips between the front and back of house employees at their discretion. In 2010, a federal court ruled that if an employer pays the minimum wage, it can require that gratuities be shared among the entire staff. The following year, The Labor Department under President Obama declared that tips are the property of the employee only and the employer could not pool funds for the kitchen staff, which is the current federal policy. What it could mean nationally. The relaxing of this ruling could make it easier for operators to deal with the burden of the rapidly rising wages, by giving them more options. This would have the most impact on states such as Texas, who currently have a state tip credit and would have to decide to abandon it for the new FLSA guidelines. What it could mean in California. a. It is for employees only. b. The tips in the pool were given to employees. c. The participants in the tip pool DO NOT include people who don’t customarily receive tips (like dishwashers, cooks, and janitors). d. The owners, the managers, and the supervisors may not share in the pool. 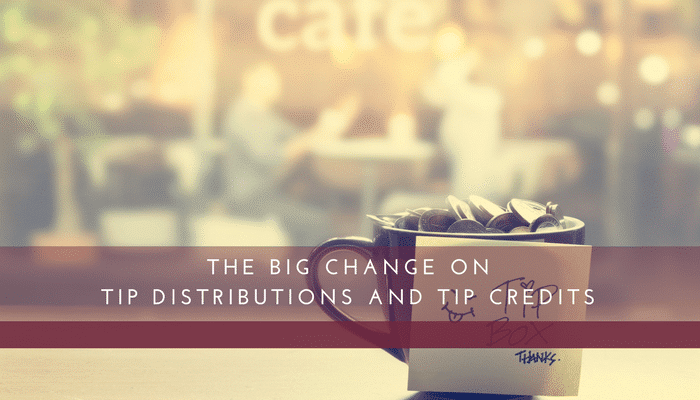 But If these Federal changes go into effect, there may be increasing pressure to reverse the Ninth Circuit Court ruling which would open up the tip distributions options to largest restaurant market (82.2 billion estimated sales for 2017) in the country. In addition, The U.S. Supreme Court is considering whether to review a challenge to the 2011 tip-polling ban from the National Restaurant Association and others. We at KROST have been on the front lines on this issue and have developed many tried and true systems to fit any type or size operation that can take the confusion and difficulty out of setting up and maintaining these protocols. We will help with your current POS system and can also recommend the latest tipping software solutions.